Capt. Zitkowski, Gr Oper. Officer; S/Sgt Russell, Ground Crew; Sgt Bleiman, CFC Maintenance; T/Sgt William R. Hehe (Hayms), Ground Crew Chief; M/Sgt Kile, Line Crew Chief. 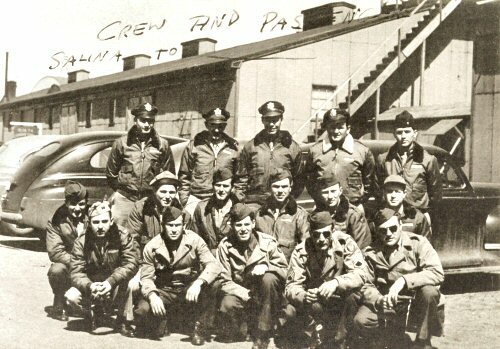 T/Sgt Max L. Sampsel, CFC Gunner; Sgt Jerell L. Taylor, RG; Cpl Henry T. Matthaus, TG; M/Sgt Lloyd E.. Geringer, FE; Sgt Lloyd Volkmar, Radio Operator; S/Sgt Clarence Martin,LG. 1st Lt Thomas H. Brennan, Jr.
15 December 2007 - Howard added to Crew Honor Row. 27 May 2007 - Brennan added to Crew Honor Row. The mission was a night incendiary raid on downtown Tokyo and nearby waterfront. The visual bomb run was made at 9,100 feet in clear weather. Searchlights picked up four minutes short of the target and remained on us for a total of nine minutes. One fighter made a pass at us over the target and several others were seen. About 50 flares were seen (many carried explosives). A "fireball" picked us up at the coast and followed us for 50 miles before falling off toward the sea. We were hit several times by flak - hole in the nose, three in the left wing, several in the bomb bay and center wing tank areas, two in the top blister and an undetermined number in the tail compartment and tail surfaces. We had also seen a B-29 go down in a flat spin with wing fire. The medics believed that Matthaus had died shortly after being hit. Source: Charles A. Smith, Radar, P-44 for "History of the 39th Bomb Group"